Following closely the developments of the Los Angeles cultural scene for a almost twenty years, I'm glad to report that artwise, favorable weather conditions prevail in the City of Angels. The Mayor's office announced yesterday the appointment of a new cultural affairs chief, Olga Garay, whose rather impressive resume bodes well for her new job here in LA. Among other assignments, she served as program director for the arts at the Doris Duke Foundation, where, during her tenure, $145 million was doled out to various art organizations. Here in LA, she will have a much smaller purse -- a measly $9.9 million annual budget -- something that even Mayor Villaraigosa acknowledged as a kind of embarrassment; among major American cities we are in last place in this regard. What's encouraging is that the mayor welcomed her with $250,000 set aside for the development of a "cultural master plan." And talking about our mayor, it's difficult not to be taken by this suave politician referring casually to Bertolt Brecht and, according to the LA Times, turning his offices into a sort of "revolving gallery of loaned artworks by local artists..." (LA Times Calendar, January 7, 2007) It would be interesting to have a peek into his offices and to see the art displayed there. The last time I had the chance to do that was almost ten years ago, and the art I saw there was rather tedious. Last night, LA cultural leaders gathered to welcome Jim Wood, the recently appointed President and CEO of the Getty Trust. It was an unusually relaxed event, reflecting a new, happier era of leadership at the institution involved in so much controversy in recent years. To observe the elegant crowd mingling in the museum rotunda under Tim Hawkinson's gigantic sculpture was to marvel at the contrast between his intimidating and purposefully made-on-the-cheap Uberorgan and the intricate social dance of the well-behaved, well-heeled citizens of LA. Unlike his predecessors, Jim Wood is a deeply knowledgeable person with passion and curiosity for art. He seems eager to learn about LA and in personal interaction, proves to be a very amiable and engaging man. 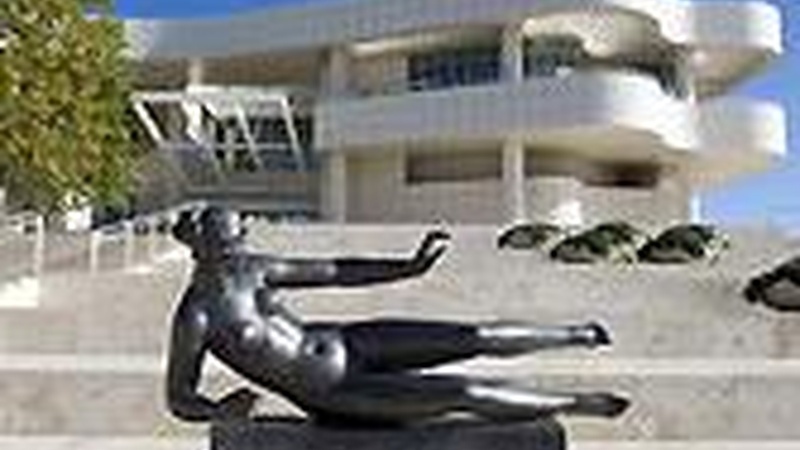 Let's hope that he will succeed in helping the Getty Center enter a new era in which the institution's deep pockets will match the new commitment to the excellence of its art collection and various other cultural projects. And now let me mention an extremely important project involving the outstanding Los Angeles video artist, Bill Viola, whose collaboration with Esa-Pekka Salonen and Peter Sellars, The Tristan Project, must be experienced by everyone who cares for art and culture in this city. Tomorrow as well as on April 24, the Disney Concert Hall is the place to be to enjoy the majestic music of Wagner paired with the somber theatricality of Bill Viola's projected images. It will be interesting to compare this production of Tristan und Isolde with the previous one seen in the Dorothy Chandler Pavilion and lavishly designed by David Hockney.